I love Bukowski, I really do, I first started reading his work last Summer when I was flat out broke and had no money for books - I went to my local library (really local - about a 2 minutes walk), which doesn't hold the best collection but there are some gems, one of which was The Most Beautiful Woman In Town which I read in about a day and adored. I had heard of Bukowski before but had only read his poetry, and after reading one collection of short stories I was really interested in more of his novels. I think I lent a few more from libraries over that Summer but I'm not sure which they were - never the less they steered me onto buying my own copies - one of which was Ham On Rye. Ham On Rye is the story of Bukowski's mostly autobiographical alter ego Henry Chinaski as he goes through childhood and his teenage years and If you don't like his other novels you're not going to like this one. I was really interested to read this book because I always wonder how Bukowski became the man he was, and how he formed himself into such a person and this book did answer those questions that I had but with the answer; He was just like that. As I said the book is mostly autobiographical but with some people who write autobiographies they write with a certain message in mind, either sadness or a comedic factor etc. They highlight and emphasise the parts of their past which fit in with who they are now - because that's why we're reading the book - to find out more about them. We don't want to read things that are pointless or have nothing to do with anything that impacted the persons life, and although I think Bukowski does do this here - highlights and shows us parts of his past which have stuck with him - which he believes has shaped him, there are some parts which don't connect to the rest of the "story", but I enjoy them just the same. I think I would probably just enjoy anything the man has written, he seems to be a very "Marmite" kind of writer (If you don't know what Marmite is it's a kind of yeast extract spread for toast and sandwiches and in the UK the tagline of the product is "You either love it or you hate it".) Some people don't have much time for his writing at all - which is understandable I suppose, it would be very easy to just label Bukowski a drunk and discount his work but He has grown to be one of my very favourite writers over the past year and I for one just can't get enough. 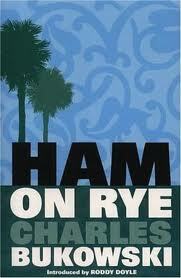 With Ham On Rye I found myself sympathising with young Hank Chinaski many times over. His story isn't the happiest but he doesn't dwell on the unhappy times or ask the audience to pity him. He's very much a normal man, and was a normal boy. Throughout the book Hank does nothing extra-ordinary, he goes through no great romance or any glittering opportunities - he just lives his life and lets us see into it a little bit. A great read packed with great writing, If you like Bukowski and haven't read this, then definitely do so. If you've not read his work before then maybe start with Ham On Rye - then you could read "Hank's" life chronologically, and what a treat that would be! Happy Halloween everyone - Is anyone dressing up? What as? I hope you are all wonderfully ill on your poison of choice - be it sweets or alcohol. I'll be indulging in a happy mix of the two!